It was the last week of September, and Mercury was still in retrograde. I had looked forward to my first theatre outings of the BAM Next Wave autumn season. The first production for which we had tickets was Sophocles’ Antigone in a new adaptation by Anne Carson directed by Ivo Van Hove, playing at the BAM Harvey. 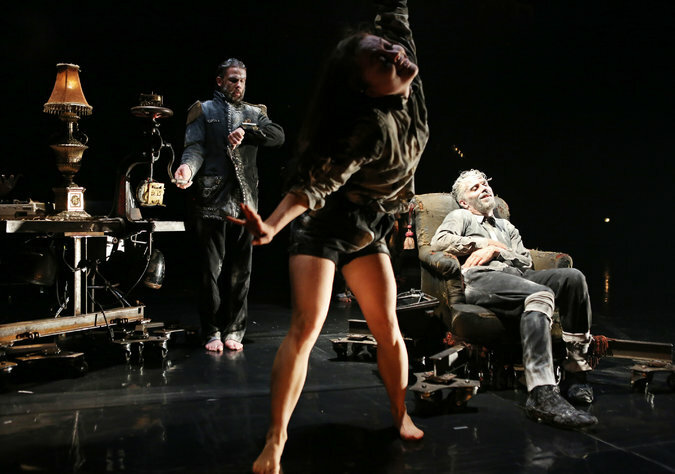 It’s catch-as-catch-can with van Hove – sometimes his productions are exhilarating, sometimes exhausting. I’d enjoyed his 5 1/2 hour Roman Tragedies, Shakespeare’s three Roman plays (in Dutch) (http://www.mollyismusing.blogspot.com/2012/11/friends-romans-dutch.html), but could not say the same for others. This time around, the British cast is led by Juliette Binoche, who, while she looks better than most women look ever, cannot pass for the essentially teenaged — in body and mind — Antigone. 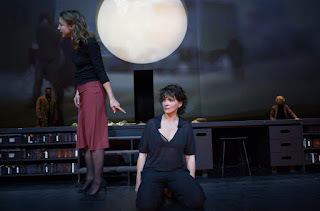 Whoever plays her, Antigone should be young and impetuous and passionate, whereas Ms. Binoche merely shouted her frustration. The production includes a beautiful backdrop with alternating sun/moon/eclipses happening back there, although at some points the desert sun was just too bright. While I understand the fiscal sense of double-casting in a traveling production, only Eurydice (Kathryn Pogson) consistently differentiated her “Chorus” character from her wife of Creon character. When the audience cannot tell if the actor is playing Ismene (Kirsty Bushell) or Haimon or members of the Chorus, clearly some doubling just doesn’t pay. Antigone is an interesting story, with valid problems to probe, but the actors in van Hove’s production were so busy emoting that the right questions weren’t asked. Ms. Carson’s adaptation and Mr. van Hove’s production added nothing to the canon of Antigone. The next evening we went to BAM’s Opera House to see James Thiérée and his company perform a piece called Tabac Rouge. M. Thiérée and his company are marvelous performers, extraordinarily skilled in circus gymnastics and dance. Unfortunately, that evening things went wrong. The performance (not the first time in the space) started ¾ hour late and played ¼ longer than originally stated. It was dark, visually and presumably thematically as well. 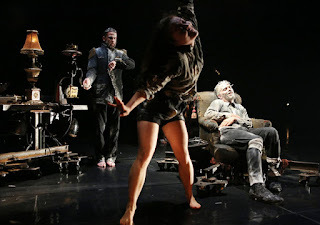 It began so very slowly, which is not unusual for the troupe, but when the non-narrative dragged on in the same vein, I waited, needing the performers to pull me in. They did not, despite some unfortunately few and far between magical moments. I’ve seen this company perform several times, and have generally enjoyed whatever they gave. The company does not do linear pieces, and we are talking weird: the audience must and does surrender to whatever vision comes forth. But Tabac Rouge just didn’t work for me. Sadly, I was bored to tears, the confusion and darkness lulled me into nodding off more than once. I’ve already apologized to my friends for waking with a snore, and now I’ll happily apologize to other members of the audience for the disturbance. But that’s all I can do. Tabac Rouge appeared to be a Steampunk “Lord of the Flies,” but the island was wood and metal and filled with screaming feral females, all gathered 'round the dominant male, Monsieur Thiérée. All the performers are extraordinary, twisting and turning their powerful bodies this way and that, but I really didn’t like the show at all. Two unpleasant theatre experiences in a row, for both of which I had high hopes. Not a good way to start my fall season. But then, despite the fact that Mercury was yet in retrograde, the weekend served up something jollier when a friend and I attended “Hand to God,” expecting an amusing evening and no more. 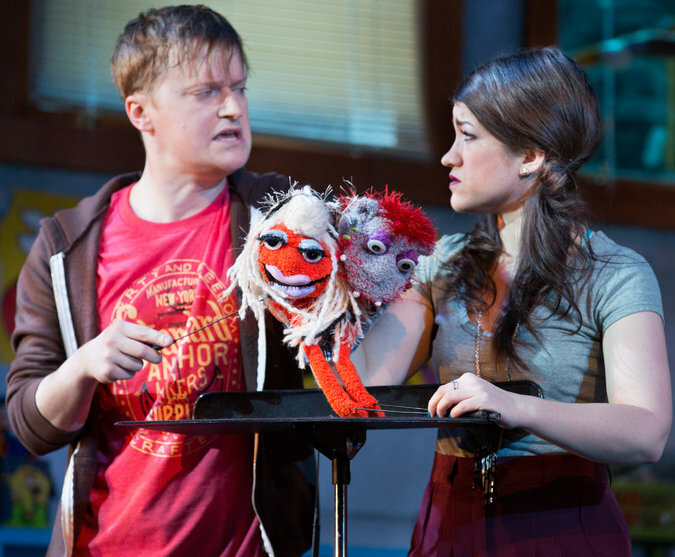 Hand to God is very, very funny. Every performance is excellent (as are the set, lights, sound, all), and the “understudy” we saw in the female lead was fully integrated with the rest of the company and quite marvelous. 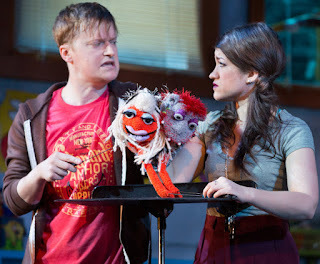 There’s little time for thought during the evening, as the audience continually roars with laughter, so you don’t worry about things like “is it a play or a sketch.” Hand to God presumably started life as a more than clever sketch that someone told the playwright to expand into a play with a through-line. He did, and that made the second act a bit unbalanced with too much denouement, but it was brief, and the evening‘s performances kept the audience gasping for breath between laughs. The language and story are utterly profane, the psychology perhaps juvenile, but sometimes there is just no need to think about such things. Bravo to playwright Robert Askins and director Moritz von Stuelpnagel for a fun evening at the Booth Theatre with stellar performances from Steven Boyer, Mark Kudisch, Pamela Bob, Sarah Stiles, and Michael Oberholtzer. Whatever Hand to God is, it sure is funny. Happily, Mercury is no longer in retrograde, so we can all go back to the theatre in safety.